I see this car just about every day, so I figured I'd snap a photo. Although the Metro, especially the second-generation, isn't customized too often, the owner of this Metro has spiced his subcompact up a bit. The bronze Rota wheels (15"? )with the white paint make it look pretty decent! The car has aftermarket fog lights, tinted windows, and a polished muffler tip. 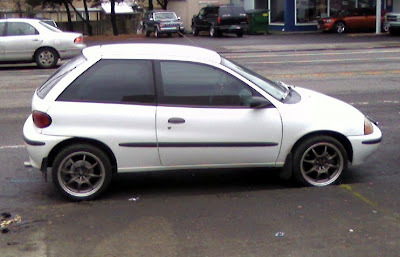 Some lowering springs would cap off this Metro quite nicely!